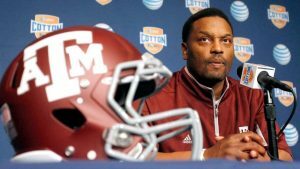 On Thursday, Texas A&M football head coach Kevin Sumlin’s wife used Twitter to share a racist, threatening letter that her husband received in the mail, following his team’s opening week loss to the UCLA Bruins on Sunday night. Charlene Sumlin tweeted “how is any of this okay?” and noted that one of the couple’s children could have been the one to open the letter. The letter said Sumlin sucked as a head coach, and that he was a n— and could not win. The letter said for him to get lost or else. Some people said that the letter, which was sent from an unknown and unnamed sender, had as a return address that of the Houston Country Club. The contents of the letter drew widespread condemnation across the Internet on sites from social media to news and sports, as well as from both the university and the officials from the Southeastern Conference. The President of Texas A&M Michael Young and Athletic Director Scott Woodard via a joint statement said that they became aware of the letter on Tuesday evening that was received at the Sumlin home and unequivocally condemn the threatening and disgusting letter. The statement went on to say that the community will not let the ignorance of some to intimidate even one member of the community. It concluded by saying on behalf of all members of the Aggies family, our thoughts are with Sumlin and his entire family and everything will be done to ensure their safety. The university is working with local law enforcement to bring the person who sent the letter to justice, said school officials. Greg Sankey the Commissioner of the Southeastern Conference said via his Twitter account that he has great admiration for Coach Sumlin and fully supported the Texas A&M administrators’ statement. He called the letter sickening. Texas A&M suffered a devastating 45-44 loss Sunday after leading 44-10 late in the third quarter. The loss added pressure to Sumlin as he has guided the team to three straight seasons of 8-5, with a pair of losses in bowl games. Those are the kind of results that are considered disappointing at a program that had been ranked in the nation’s top 10 at some point during each of the three seasons. Woodward said during the summer that Sumlin is aware he needs to win and win this season. After the loss on Sunday, an attorney Tony Buzbee, who is based in Texas, and a member of the Board of Regents at A&M, said on his Facebook page that when it is time to vote, he will vote that Sumlin must go.